For other uses of terms redirecting here, see Macedonian struggle and IMRO (disambiguation). Art. 1. The goal of BMARC is to secure full political autonomy for the Macedonia and Adrianople regions . Art. 2. To achieve this goal they [the committees] shall raise the awareness of self-defense in the Bulgarian population in the regions mentioned in Art. 1., disseminate revolutionary ideas – printed or verbal, and prepare and carry on a general uprising. Art. 1. The Secret Macedonian-Adrianople organization has the goal of uniting all the disgruntled elements in Macedonia and the Adrianople region, regardless of their nationality, to win, through a revolution, a full political autonomy for these two regions. Art. 2. To achieve this goal the organization fights to throw over the chauvinist propagandas and nationalist quarrels that are splintering and discouraging the Macedonian and Adrianople populations in his struggle against the common enemy; acts to bring in a revolutionary spirit and consciousness among the population, and uses all the means and efforts for the forthcoming and timely armament of the population with all that is needed for a general and universal uprising. Art. 3. The Secret Macedonon-Adrianoplitan revolutionary organization consists of local revolutionary organizations (bands) consisting of the members of local towns or villages. Art. 1. – The goal of the Internal Macedonian-Adrianople Revolutionary Organization is to unite any and all dissatisfied elements in Macedonia and the Adrianople Vilyaet without regard to their nationality so that political autonomy can be gained for these two regions. Art. 2. The Organization opposes any other country's intentions to divide and conquer these two regions. Poster of most important members of IMARO and SMAC between 1893 and 1913. The Internal Macedonian Revolutionary Organization (IMRO; Bulgarian: Вътрешна Македонска Революционна Организация (ВМРО), Vatreshna Makedonska Revolyutsionna Organizatsiya (VMRO); Macedonian: Внатрешна Македонска Револуционерна Организација, Vnatrešna Makedonska Revolucionerna Organizacija) was a revolutionary national liberation movement in the Ottoman territories in Europe, that operated in the late 19th and early 20th centuries. Founded in 1893 in Salonica, initially its aim was to gain autonomy for Macedonia and Adrianople regions in the Ottoman Empire, however later it became an agent serving Bulgarian interests in Balkan politics. IMRO group modeled itself after the Internal Revolutionary Organization of Vasil Levski and accepted its motto "Freedom or Death" (Свобода или смърть). Starting in 1896 it fought the Ottomans using guerrilla tactics, and in this they were successful, even establishing a state within state in some regions, including their own tax collectors. This effort escalated in 1903 into the Ilinden–Preobrazhenie Uprising. The fighting involved about 15,000 IMRO irregulars and 40,000 Ottoman soldiers. After the uprising failed, and the Ottomans destroyed some 100 villages, the IMRO resorted to more systematic forms of terrorism targeting civilians. During the Balkan Wars and the First World War the organization supported the Bulgarian army and joined to Bulgarian war-time authorities when they temporarily took control over parts of Thrace and Macedonia. In this period autonomism as a political tactic was abandoned and annexationist positions were supported, aiming eventual incorporation of occupied areas into Bulgaria. After the First World War the combined Macedonian-Thracian revolutionary movement separated into two detached organizations, IMRO and ITRO. After this moment the IMRO earned a reputation as an ultimate terror network, seeking to change state frontiers in the Macedonian regions of Greece and Serbia (later Yugoslavia). They contested the partitioning of Macedonia and launched raids from their Petrich stronghold into Greek and Yugoslav territory. Their base of operation in Bulgaria was jeopardized by the Treaty of Niš, and the IMRO reacted by assassinating Bulgarian prime minister Aleksandar Stamboliyski in 1923, with the cooperation of other Bulgarian elements opposed to him. In 1925 the Greek army launched a cross-border operation to reduce the IMRO base area, but it was ultimately stopped by the League of Nations, and IMRO attacks resumed. In the interwar period the IMRO also cooperated with the Croatian Ustaše, and their ultimate victim was Alexander I of Yugoslavia, assassinated in France in 1934. After the Bulgarian coup d'état of 1934, their Petrich stronghold was subjected to military crackdown by the Bulgarian army, and the IMRO was reduced to a marginal phenomenon. The organization changed its name on several occasions (see below). After the fall of communism in the region, numerous parties claimed the IMRO name and lineage to legitimize themselves. Among them, in Bulgaria a right-wing party carrying the prefix "VMRO" was established in the 1990s, while in the Republic of Macedonia a right-wing party was established under the name "VMRO-DPMNE". The revolutionary organization should be established within Macedonia and should act there so that the Greeks and Serbs couldn't label it as a tool of the Bulgarian government. Its founders should be locals and living in Macedonia. The political motto of the organization should be the autonomy of Macedonia. From the Macedonian immigrants in Bulgaria and the Bulgarian society, only moral and material help for the struggle of the Macedonian revolutionaries should be required. We talked a long time about the goal of this organization and at last we fixed it on autonomy of Macedonia with the priority of the Bulgarian element. We couldn't accept the position for "direct joining to Bulgaria" because we saw that it would meet big difficulties by reason of confrontation of the Great powers and the aspirations of the neighbouring small countries and Turkey. It passed through our thoughts that one autonomous Macedonia could easier unite with Bulgaria subsequently and if the worst comes to the worst, that it could play a role as a unifying link of a federation of Balkan people. The region of Adrianople, as far as I remember, didn't take part in our program, and I think the idea to add it to the autonomous Macedonia came later. We grouped together and jointly worked out a statute. It was based on the same principles: demand for the implementation of the Berlin Treaty. The statute was worked out after the model of the Bulgarian revolutionary organisation before the Liberation. Our motto was "Implementation of the resolutions of the Berlin Treaty". We established a "Central Committee" with branches, membership fees, etc. Swearing in for each member was also envisaged. In the regulations, there was nothing concerning the Serbian propaganda but we intended to counteract it by enlightening the people. The Adrianople Region was the general name given by the Organization to those areas of Thrace which, like Macedonia, had been left under Turkish rule i.e. most of it, where the Bulgarian element predominated in the mixed population, too. The organized revolutionary movement in Thrace dates from 1895, when Dame Gruev recruited Hristo Kotsev, born in Shtip, who was then a teacher in the Bulgarian Men's High School of Adrianople. Acting in the name of the Central Committee, Kotsev set up a regional committee in Adrianople, and gradually committees were established in a large area. Based on historical evidences, it is believed by Bulgarian, Western and Russian historians that in 1896 or 1897 this first and probably unofficial name was changed to Bulgarian Macedonian-Adrianople Revolutionary Committees (BMARC); and the organisation existed under this name until 1902, when it was changed to Secret Macedonian-Adrianople Revolutionary Organization (SMARO). While part of the Macedonian historians also acknowledge the existence of the name "ВMARC" in the very early period of the Organisation (1894–1896), in the Republic of Macedonia it is generally assumed that in the 1896–1902 period the name of the organization was "SMARO". Both sides lack conclusive documentary evidence, as neither of these names appears in the IMRO documents but is known from undated printed or handwritten statutes. However, Macedonian historians point to the fact that a copy of the "SMARO" statute is kept in London under the year of 1898. [dubious – discuss] It is not disputed that the organization changed its name to Internal Macedonian-Adrianople Revolutionary Organization (IMARO) in 1905 and it is under this name referred to in Bulgarian historiography. After disbanding itself during the first Bulgarian annexation of Macedonia (1915–1918), the organization was revived in 1920 under the name Internal Macedonian Revolutionary Organization (IMRO), under which it is generally known today. The stated goal of the original Committee was to unite all elements dissatisfied with the Ottoman oppression in Macedonia and the Adrianople Vilayet, eventually obtaining political autonomy for the two regions. In this task, the organisation hoped to enlist the support of the local Vlachs, Greeks and even Turks. Efforts were concentrated on moral propaganda and the prospect of rebellion and terrorist actions seemed distant. The organization developed quickly: only in a matter of a few years, the Committee had managed to establish a wide network of local organisations across Macedonia and the Adrianople Vilayet. These usually centered around the schools of the Bulgarian Exarchate and had as leaders local or Bulgarian-born teachers. When, in addition to these advantages, the Bulgarophil Macedonians started their marvellously-organised revolutionary committee in 1893, the Servian cause received its death-blow. By way of emphasising her antagonism to Bulgaria, official Servia now adopted an openly Turcophil policy, and nothing could be more fatal to the prospects of any Christian race in Turkey. The Macedonian peasantry will bestow their allegiance only on a propaganda which promises them some speedy prospect of release from the Ottoman yoke. The Servian movement is a purely official agitation, guided and financed in Belgrade; whereas, despite the sympathy of Sofia, the Bulgarian Revolutionary Committee is a genuine Macedonian organisation. What is more, some of its younger leaders espoused radical socialist and anarchist ideas and saw their goal as the establishment of a new form of government rather than unification with Bulgaria. Eventually, these considerations led the organisation to change its statute and accept as members not only Bulgarians but all Macedonians and Odrinians regardless of ethnicity or creed. In reality, however, besides some Vlach members, its membership remained overwhelmingly Bulgarian Exarchist. I think that was the force of the abstract thought, that they kept in their mind, a thought which was far from chauvinism, because freedom for them stood higher than the rule of the Bulgarian, for them it was one perfect system equally applicable to Bulgarians, Greeks and Turks, a kind of heaven to which the whole world should aim. The general staff considers for its duty to pay attention of the honoured Bulgarian government to the catastrophic consequences for Bulgarian nation, in case the government doesn't fulfill its duty toward its homogeneous brothers here in an impressible and energetic way, imposed by the circumstances and the danger, which threaten Bulgarian fatherland today. We can call the Uprising whatever we like, but in fact, it was only a partial movement. It was, and still is, an affair of the Exarchists: that is, a Bulgarian ploy to settle the Macedonian question to its own advantage by creating a Bulgarian Macedonia... If the autonomy of Macedonia should result from the present Uprising, the Macedonian question will be settled not to the advantage of the Macedonians but of the Bulgarians, for the Committee, as we have seen earlier, is working behind a Bulgarian front... Thus the reason why the Uprising failed is perfectly clear: from the very outset it was established on the wrong basis instead of being a general Macedonian Uprising it was a partial insurrection with Bulgarian overtones. The only Macedonian Slavs who played a leading part in the Uprising were those who called themselves Bulgarians. Firstly the revolutionary organization began to work among the Bulgarian population, even not among the whole of it, but only among this part, which participated in the Bulgarian Exarchate. IMRO treated suspiciously to the Bulgarians, which participated in other churches, as the Greek Patriarchate, the Catholic Church and the Protestant Church. As to the revolutionary activity among the other nationalities as Turks, Albanians, Greeks and Vlahs, such question did not exist for the founders of the organization. These other nationalities were for IMRO foreign people... Later, when the leaders of IMARO saw, that the idea for liberation of Macedonia can find followers among the Bulgarians non-Exarchists, as also among the other nationalities in Macedonia, and under the pressure from IMARO-members with left, socialist or anarchist convictions, they changed the statute of IMARO in sense, that member of IMARO can be any Macedonian, regardless of ethnicity or religious denomination. The initial period of idealism for IMARO ended, however, with the Vinitsa Affair and the discovery by the Ottoman police of a secret depot of ammunition near the Bulgarian border in 1897. The wide-scale repressions against the activists of the Committee led to its transformation into a militant guerilla organization, which engaged into attacks against Ottoman officials and punitive actions against suspected traitors. The guerilla groups of IMARO, known as "chetas" (чети) later (after 1903) also waged a war against the pro-Serbian and pro-Greek armed groups during the Greek Struggle for Macedonia. IMARO's leadership of the revolutionary movement was challenged by two other factions: the Macedonian Supreme Committee in Sofia (Vurhoven makedono-оdrinski komitet - Върховен македоно-одрински комитет) and a smaller group of conservatives in Salonica – Bulgarian Secret Revolutionary Brotherhood (Balgarsko Tayno Revolyutsionno Bratstvo). The latter was incorporated in IMARO by 1902 but its members as Ivan Garvanov, were to exert a significant influence on the organization. The battle flag of the Struga insurgent detachment during the Ilinden uprising with motto Свобода или смърть. In Spring 1903, a group by young anarchists connected with IMARO from the Gemidzhii Circle – graduates from the Bulgarian secondary school in Thessaloniki – launched a campaign of terror bombing with the aim to attract the attention of the Great Powers to Ottoman oppression in Macedonia and Eastern Thrace. In the same time the undisputed leader of the organization, Gotse Delchev, was killed in a skirmish with Turkish forces. Although Delchev had opposed the ideas for an uprising as premature, he finally had no choice but agree to that course of action but at least managed to delay its start from May to August. After his death in 1903 IMARO organised the Ilinden-Preobrazhenie Uprising against the Ottomans in Macedonia and the Adrianople Vilayet, which after the initial successes including the forming of the Krushevo Republic, was crushed with much loss of life. General Tsontcheff, with revolutionists in 1904. The failure of the 1903 insurrection resulted in the eventual split of the IMARO into a left-wing (federalist) faction in the Seres and Strumica districts and a right-wing faction (centralists) in the Salonica, Monastir, and Uskub (present-day Skopje) districts. The left-wing faction opposed Bulgarian nationalism and advocated the creation of a Balkan Socialist Federation with equality for all subjects and nationalities. The Supreme Macedonian Committee was disbanded in 1903 but the centralist faction of the IMORO drifted more and more towards Bulgarian nationalism as its regions became increasingly exposed to the incursions of Serb and Greek armed bands, which started infiltrating Macedonia after 1903. The years 1905–1907 saw lots of violent fighting between IMORO and Turkish forces as well as between IMORO and Greek and Serb detachments. Meanwhile, the split between the two factions became final when in 1907 Todor Panitza killed the right-wing activists Boris Sarafov and Ivan Garvanov. The armed Albanian bands of Çerçiz Topulli cooperated and were on good terms with armed groups of Bulgarian-Macedonian revolutionaries operating in the Lake Prespa region and Kastoria area, a bond formed due to their hostility toward Greeks. After the Young Turk Revolution of 1908 both factions laid down their arms and joined the legal struggle. Yane Sandanski and Hristo Chernopeev contacted the Young Turks and started legal operation. They tried to set up the Macedonian-Adrianople Revolutionary Organization (MARO). Initially, the group developed only propaganda activities. Later, the congress for MARO's official inauguration failed and federalist wing joined mainstream political life as the Peoples' Federative Party (Bulgarian Section). Some of its leaders like Sandanski and Chernopeev participated in the march on Istanbul to depose the counter-revolutionaries. The former centralists formed the Union of the Bulgarian Constitutional Clubs and like the PFP participated in Ottoman elections. Soon, however, the Young Turk regime turned increasingly nationalist and sought to suppress the national aspirations of the various minorities in Macedonia and Thrace. This prompted most right-wing and some left-wing IMARO leaders to resume the armed fight in 1909. In January 1910 Hristo Chernopeev and some of his followers founded a Bulgarian People's Macedonian-Adrianople Revolutionary Organization. In 1911 a new Central Committee of IMARO was formed consisting of Todor Alexandrov, Hristo Chernopeev and Petar Chaulev. Its aim was to restore unity to the Organisation and direct the new armed struggle against the Turks more efficiently. After Chernopeev was killed in action in 1915 as a Bulgarian officer in World War I, he was replaced by the former supremist leader General Alexander Protogerov. During the Balkan Wars former IMARO leaders of both the left and the right joined the Macedonian-Adrianopolitan Volunteer Corps and fought with the Bulgarian Army. Others like Sandanski with their bands assisted the Bulgarian army with its advance and still others penetrated as far as the region of Kastoria southwestern Macedonia. In the Second Balkan War IMORO bands fought the Greeks and Serbs behind the front lines but were subsequently routed and driven out. Notably, Petar Chaulev was one of the leaders of the Ohrid-Debar Uprising organised jointly by IMORO and the Albanians of Western Macedonia. Sandanski (left) with IMARO members supporting Bulgarian troops during Balkan wars. The Tikvesh Uprising was another uprising in late June 1913, organized by the Internal Macedonian Revolutionary Organization against the Serbian occupation of Vardar Macedonia and took place behind the Serbian enemy lines during the Second Balkan War. The result of the Balkan Wars was that the Macedonian region and Adrianople Thrace was partitioned between Bulgaria, Greece, Serbia and the Ottoman Empire (the new state of Yugoslavia was created as after 1918 and started its existence as Kingdom of the Serbs, Croats and Slovenians "SHS"), with Bulgaria getting the smallest share. In 1913 the whole Thracian Bulgarian population from the Ottoman part of Eastern Thrace was forcibly expelled to Bulgaria. IMARO, now led by Todor Aleksandrov, maintained its existence in Bulgaria, where it played a role in politics by playing upon Bulgarian irredentism and urging a renewed war to liberate Macedonia. This was one factor in Bulgaria allying itself with Germany and Austria-Hungary in World War I. During the First World War in Macedonia (1915–1918) the organization supported Bulgarian army and joined to Bulgarian war-time authorities when they took control over Vardar Macedonia temporarily until the end of war. In this period the autonomism as political tactics was abandoned from all internal IMARO streams and all of them shared annexationist positions, supporting eventual incorporation of Macedonia in Bulgaria. IMARO organised the Valandovo action of 1915, which was an attack on a large Serbian force. Bulgarian army, supported by the organization's forces, was successful in the first stages of this conflict, managed to drive out the Serbian forces from Vardar Macedonia and came into positions on the line of the pre-war Greek-Serbian border, which was stabilized as a firm front until end of 1918. In 1917 IMRO detachments crushed the Toplica insurrection in Eastern Serbia. The post-war Treaty of Neuilly again denied Bulgaria what it felt was its share of Macedonia and Thrace. After this moment the combined Macedonian-Adrianopolitan revolutionary movement separated into two detached organizations: Internal Thracian Revolutionary Organisation (bulg. Вътрешна тракийска революционна организация) and Internal Macedonian Revolutionary Organisation. ITRO was a revolutionary organisation active in the Greek regions of Thrace and Macedonia to the river Strymon and Rhodope Mountains between 1922 and 1934. The reason for the establishment of ITRO was the transfer of the region from Bulgaria to Greece in May 1920. ITRO proclaimed its goal as the "unification of all the disgruntled elements in Thrace regardless of their nationality", and to win full political independence for the region. Later IMRO created as a satellite organisation the Internal Western Outland Revolutionary Organisation (bulg. Вътрешна западнопокрайненска революционна организация), which operated in the areas of Tsaribrod and Bosilegrad, ceded to Yugoslavia. IMRO began sending armed bands called cheti into Greek and Yugoslav Macedonia and Thrace to assassinate officials and stir up the spirit of the oppressed population. On 23 March 1923 Aleksandar Stamboliyski, who favoured a détente with Greece and Yugoslavia, so that Bulgaria could concentrate on its internal problems, signed the Treaty of Niš with the Kingdom of Serbs, Croats and Slovenes and undertook the obligation to suppress the operations of the IMRO carried out from Bulgarian territory. However, in the same year IMRO agents assassinated him. IMRO had de facto full control of Pirin Macedonia (the Petrich District of the time) and acted as a "state within a state", which it used as a base for hit and run attacks against Yugoslavia with the unofficial support of the right-wing Bulgarian government and later Fascist Italy. Because of this, contemporary observers described the Yugoslav-Bulgarian frontier as the most fortified in Europe. In 1923 and 1924 during the apogee of interwar military activity according to IMRO statistics in the region of Yugoslav (Vardar) Macedonia operated 53 chetas (armed bands), 36 of which penetrated from Bulgaria, 12 were local and 5 entered from Albania. The aggregate membership of the bands was 3245 komitas (guerilla rebels) led by 79 voivodas (commanders), 54 subcommanders, 41 secretaries and 193 couriers. 119 fights and 73 terroristic acts were documented. Serbian casualties were 304 army and gendarmery officers, soldiers and paramilitary fighters, more than 1300 were wounded. IMRO lost 68 voivodas and komitas, hundreds were wounded. In the region of Greek (Aegean) Macedonia 24 chetas and 10 local reconnaissance detachments were active. The aggregate membership of the bands was 380 komitas led by 18 voivodas, 22 subcommanders, 11 secretaries and 25 couriers. 42 battles and 27 terrorist acts were performed. Greek casualties were 83 army officers, soldiers and paramilitary fighters, over 230 were wounded. IMRO lost 22 voivodas and komitas, 48 were wounded. Thousands of locals were repressed by the Yugoslav and Greek authorities on suspicions of contacts with the revolutionary movement. The population in Pirin Macedonia was organized in a mass people's home guard. This militia was the only force, which resisted the Greek army when the Greek dictator, General Pangalos launched a military campaign against Petrich District in 1925. In 1934 the Bulgarian army confiscated 10,938 rifles, 637 pistols, 47 machine-guns, 7 mortars and 701,388 cartridges only in the Petrich and Kyustendil Districts. At the same time, an youth's extension of IMRO, the Macedonian Youth Secret Revolutionary Organization was created. The statute of MYSRO was approved personally from IMRO's leader Todor Alexandrov. The aim of MYSRO was in concordance with the statute of IMRO – unification of all of Macedonia in an authonomous unit, within a future Balkan Federative Republic. Nikola Pitu Gulev with interwar IMRO uniform. The Sixth Congress of the Balkan Communist Federation under the leadership of the Bulgarian communist Vasil Kolarov and the Fifth Congress of the Comintern, an adjunct of the Soviet foreign policy, held concurrently in Moscow in 1923, voted for the formation of an "Autonomous and Independent Macedonia and Thrace." In 1924 IMRO entered negotiations with the Macedonian Federative Organization and the Comintern about collaboration between the communists and the Macedonian movement and the creation of a united Macedonian movement. The idea for a new unified organization was supported by the Soviet Union, which saw a chance for using this well developed revolutionary movement to spread revolution in the Balkans and destabilize the Balkan monarchies. Alexandrov defended IMRO's independence and refused to concede on practically all points requested by the Communists. No agreement was reached except for a paper "Manifesto" (the so-called May Manifesto of 6 May 1924), in which the objectives of the unified Macedonian liberation movement were presented: independence and unification of partitioned Macedonia, fighting all the neighbouring Balkan monarchies, forming a Balkan Communist Federation and cooperation with the Soviet Union. Failing to secure Alexandrov's cooperation, the Comintern decided to discredit him and published the contents of the Manifesto on 28 July 1924 in the "Balkan Federation" newspaper. VMRO's leaders Todor Aleksandrov and Aleksandar Protogerov promptly denied through the Bulgarian press that they've ever signed any agreements, claiming that the May Manifesto was a communist forgery. Shortly after, Todor Alexandrov was assassinated in unclear circumstances and IMRO came under the leadership of Ivan Mihailov, who became a powerful figure in Bulgarian politics. While IMRO's leadership was quick to ascribe Alexandrov's murder to the communists and even quicker to organise a revenge action against the immediate perpetrators, there is some doubt that Mihailov himself might have been responsible for the murder. Some Bulgarian and Macedonian historians like Zoran Todorovski speculate that it might have been the circle around Mihailov who organised the assassination on inspiration by the Bulgarian government, which was afraid of united IMRO-Communist action against it. However, neither version is corroborated by conclusive historical evidence. The result of the murder was further strife within the organisation and several high-profile murders, including that of Petar Chaulev (who led the Ohrid-Debar Uprising against the Serbian occupation) in Milan and ultimately Protogetov himself. In this interwar period IMRO led by Aleksandrov and later by Mihailov took actions against the former left-wing assassinating several former members of IMORO's Sandanist wing, who meanwhile had gravitated towards the Bulgarian Communist Party and Macedonian Federative Organization. Gjorche Petrov was killed in Sofia in 1922, Todor Panitsa (who previously killed the right-wing oriented Boris Sarafov and Ivan Garvanov) was assassinated in Vienna in 1924 by Mihailov's future wife Mencha Karnichiu. Dimo Hadjidimov, Georgi Skrizhovski, Alexander Bujnov, Chudomir Kantardjiev and many others were killed in the events of 1925. Meanwhile, the left-wing later did form the new organisation based on the principles previously presented in the May Manifesto. The new organization which was an opponent to Mihailov's IMRO was called IMRO (United) was founded in 1925 in Vienna. However, it did not have real popular support and remained based abroad with no revolutionary activities in Macedonia. Mihailov's group of young IMRO cadres soon got into conflict with the older guard of the organization. The latter were in favour of the old tactic of incursions by armed bands, whereas the former favoured more flexible tactics with smaller terrorist groups carrying selective assassinations. The conflict grew into a leadership struggle and Mihailov soon, in turn, ordered the assassination in 1928 of a rival leader, General Aleksandar Protogerov, which sparked a fratricidal war between "Mihailovists" and "Protogerovists". The less numerous Protogerovists soon became allied with Yugoslavia and certain Bulgarian military circles with fascist leanings and who favoured rapprochement with Yugoslavia. The policy of assassinations was effective in making Serbian rule in Vardar Macedonia feel insecure but in turn provoked brutal reprisals on the local peasant population. Having lost a lot of popular support in Vardar Macedonia due to his policies, Mihailov favoured the "internationalization" of the Macedonian question. He established close links with the Croatian Ustashi and Italy. Numerous assassinations were carried out by IMRO agents in many countries, the majority in Yugoslavia. The most spectacular of these was the assassination of King Alexander I of Yugoslavia and the French Foreign Minister Louis Barthou in Marseille in 1934 in collaboration with the Croatian Ustashi. The killing was carried out by the VMRO assassin Vlado Chernozemski and happened after the suppression of IMRO following the 19 May 1934 military coup in Bulgaria. IMRO's constant fratricidal killings and assassinations abroad provoked some within Bulgarian military after the coup of 19 May 1934 to take control and break the power of the organization, which had come to be seen as a gangster organization inside Bulgaria and a band of assassins outside it. In 1934 Mihailov was forced to escape to Turkey. He ordered to his supporters not to resist to the Bulgarian army and to accept the disarmament peacefully, thus avoiding fratricides, destabilization of Bulgaria, civil war or external invasion. Many inhabitants of Pirin Macedonia met this disbandment with satisfaction because it was perceived as relief from an unlawful and quite often brutal parallel authority. IMRO kept its organization alive in exile in various countries but ceased to be an active force in Macedonian politics except for brief moments during World War II. Meanwhile, a resolution of the Comintern for recognition of a distinct ethnic Macedonian ethnicity, which was accepted also by the Internal Macedonian Revolutionary Organization (United), was published in January 1934. IMRO (United) remained active until 1936 when it was absorbed into the Balkan Communist Federation. IMRO used at that time, what the American journalist H. R. Knickerbocker described as: "the only system I ever heard of to guarantee that their members carry out assigned assassinations, no matter what the police terror might be". As the Bulgarian army entered Yugoslav Vardar Macedonia in 1941, it was greeted by most of the population as liberators and former IMRO members were active in organising Bulgarian Action Committees, charged with taking over the local authorities. Some former IMRO (United) members, such as Metodi Shatorov, who was the regional leader of the Yugoslav Communist Party, also refused to define the Bulgarian forces as occupiers, contrary to instructions from Belgrade and called for the incorporation of the local Macedonian Communist organisations within the Bulgarian Communist Party. This policy changed towards 1943 with the arrival of the Montenegrin Svetozar Vukmanović-Tempo, who began in earnest to organise armed resistance to the Bulgarian occupation. Many former IMRO members assisted the authorities in fighting Tempo's partizans. In Greece the Bulgarian troops, following on the heels of the German invasion of the country, occupied the whole of Eastern Macedonia and Western Thrace. In eastern and central Macedonia, some of the local Slavic-speaking minority greeted the Bulgarian troops as liberators, and efforts were undertaken by the Bulgarian authorities to "instill in them a Bulgarian national identity". Bulgaria officially annexed the occupied territories in Yugoslavia and Greece, which had long been a target of Bulgarian irredentism. IMRO was also active in organising Bulgarian militias in Italian and German occupation zones against Greek nationalist and communist groups as EAM-ELAS and EDES. With the help of Mihailov and Macedonian emigres in Sofia, several pro-Bulgarian armed detachments "Ohrana" were organised in the Kastoria, Florina and Edessa districts. These were led by Bulgarian officers originally from Greek Macedonia – Andon Kalchev and Georgi Dimchev. It was apparent that Mihailov had broader plans which envisaged the creation of a Macedonian state under a German control. It was also anticipated that the IMRO volunteers would form the core of the armed forces of a future Independent Macedonia in addition to providing administration and education in the Florina, Kastoria and Edessa districts. On 2 August 1944 (in what in the Republic of Macedonia is referred to as the Second Ilinden) in the St. Prohor Pčinjski monastery at the Antifascist assembly of the national liberation of Macedonia (ASNOM) with Panko Brashnarov (the former IMRO revolutionary from the Ilinden period and the IMRO United) as a first speaker, the modern Macedonian state was officially proclaimed, as a federal state within Tito's Yugoslavia, receiving recognition from the Allies. After the declaration of war by Bulgaria on Germany, in September 1944 Mihailov arrived in German-occupied Skopje, where the Germans hoped that he could form a pro-German Independent State of Macedonia with their support. Seeing that the war is lost to Germany and to avoid further bloodshed, he refused. Mihailov eventually ended up in Rome where he published numerous articles, books and pamphlets on the Macedonian Question. The execution of the revolutionist Kiril Gligorov by the Yugoslav authorities in 1925. Members of the IMRO (United) participated in the forming of Republic of Macedonia a federal state of Socialist Federal Republic of Yugoslavia and some of the leading members entered the government: Dimitar Vlahov, Panko Brashnarov, Pavel Shatev (the latter was the last surviving member of "Gemidzhii" or "Varkarides" in Greek, the group that executed the Thessaloniki bombings of 1903). However, they were quickly ousted by cadres loyal to the Yugoslav Communist Party in Belgrade, who had had pro-Serbian leanings before the war. According to Macedonian historian Ivan Katardjiev such Macedonian activists came from IMRO (United) and the Bulgarian Communist Party never managed to get rid of their pro-Bulgarian bias and on many issues opposed the Serbian-educated leaders, who held most of the political power. Pavel Shatev went as far as to send a petition to the Bulgarian legation in Belgrade protesting the anti-Bulgarian policies of the Yugoslav leadership and the Serbianisation of the Bulgarian language. From the start, the Yugoslav authorities organised frequent purges and trials of Macedonian communists and non-party people charged with autonomist deviation. Many of the left-wing IMRO government officials, including Pavel Shatev and Panko Brashnarov, were purged from their positions too, then isolated, arrested, imprisoned or executed by the Yugoslav federal authorities on various (in many cases fabricated) charges including: pro-Bulgarian leanings, demands for greater or complete independence of Yugoslav Macedonia, collaboration with the Cominform after the Tito-Stalin split in 1948, forming of conspirative political groups or organisations, demands for greater democracy, etc. One of the victims of these campaigns was Metodija Andonov Cento, a wartime partisan leader and president of ASNOM, who was convicted of having worked for a "completely independent Macedonia" as an IMRO member. A survivor among the communists associated with the idea of Macedonian autonomy was Dimitar Vlahov, who was used "solely for window dressing". On the other hand, former Mihailovists were also persecuted by the Belgrade-controlled authorities on accusations of collaboration with the Bulgarian occupation, Bulgarian nationalism, anti-communist and anti-Yugoslav activities, etc. Notable victims included Spiro Kitinchev, mayor of Skopje, Ilija Kocarev, mayor of Ohrid and Georgi Karev, the mayor of Krushevo during the Bulgarian occupation and brother of Ilinden revolutionary Nikola Karev. Another IMRO activist, Sterio Guli, son of Pitu Guli, reportedly shot himself upon the arrival of Tito's partisans in Krushevo in despair over what he saw as a second period of Serbian dominance in Macedonia. Also, Shatorov's supporters in Vardar Macedonia, called Sharlisti, were systematically exterminated by the YCP in the autumn of 1944, and repressed for their anti-Yugoslav and pro-Bulgarian political positions. IMRO's supporters in Bulgarian Pirin Macedonia fared no better. With the help of some former Protogerovists, their main activists were hunted by the Communist police and many of them killed or imprisoned. Because some IMRO supporters openly opposed the then official policy of Communist Bulgaria to promote Macedonian ethnic consciousness in Pirin Macedonia they were repressed or exiled to the interior of Bulgaria. Many from this persecuted people emigrated through Greece and Turkey to Western countries. At this period the American and Greek intelligence services recruited some of them, trained them and later used this so-called "Goryani" as spies and saboteurs, smuggling them back to Communist Bulgaria and Yugoslavia. Despite the fact that Yugoslav Macedonian historical scholarship reluctantly acknowledged the Bulgarian ethnic self-identification of the Ilinden IMRO leaders, they were adopted in the national pantheon of Yugoslav Macedonia as ethnic Macedonians. Official Yugoslav historiography asserted a continuity between the Ilinden of 1903 and the Ilinden of ASNOM in 1944 ignoring the fact that the first one included the uprising in the Adrianople part of Thrace region as well. The names of the IMRO revolutionaries were Goce Delchev, Pitu Guli, Dame Gruev and Yane Sandanski were included in the lyrics of the anthem of the Socialist Republic of Macedonia Denes nad Makedonija ("Today over Macedonia"). Initially Lazar Koliševski, the leader of the new Yugoslav Republic — SR Macedonia, proclaimed that the Ilinden Uprising and the IMRO were Bulgarian conspiracies. Afterwards the historical studies in the country were expanded under direct political instructions from Belgrade. It was advanced as a key principle of the Macedonian historiography, that its primary goal was to crate a separate national consciousness, and to sever any historical ties to Bulgaria. During the Cold War, particularly after the Tito–Stalin split, the heroes of 19th century left-wing IMRO, especially Delchev and Sandanski, were claimed by both Bulgaria and Yugoslavia, both internally and in a tactical game of international diplomacy. One thing that two countries had in common though was that the vague populism and anarchism of these historical figures was interpreted as a definite socialist program. Both regimes recognized the policies of the interwar leaders of the organization Todor Aleksandrov and Ivan Mihailov as "fascist". In this race, the Socialist Republic of Macedonia was the first to incorporate the IMRO figures in its national pantheon, although some careful exceptions were made. The 1903 Ilinden Uprising was presented as a direct precursor of the 1944 events, which were termed a "Second Ilinden", in an effort to prove the continuity of the struggle for independence of the Macedonian nation. Consequently, it became necessary for the socialist authorities to show that 19th century IMRO figures, particularly Delchev and Sandanski, had been consciously Macedonian in identity. Delchev and Sandanski were adopted as symbols of the republic, had numerous monuments built in their honor, and they were often the topic of articles in the academic journal Macedonian Review, as was the Ilinden Uprising. In contrast, Todor Aleksandrov was labeled a Bulgarian bourgeois chauvinist. The claim to a Macedonian identity of Sandanski was used to bolster Skopje's claim to the Pirin region. In the People's Republic of Bulgaria the situation was more complex, because the IMRO was associated with the 1923–34 anti-communist regime. Before 1960, although the subject was not taboo, few articles on the topic appeared in Bulgarian academic venues, and the IMRO figures were given mostly regional recognition in the Pirin region. After 1960, orders from the highest level were to reincorporate the Macedonian revolutionary movement in the Bulgarian history, and to prove the Bulgarian credentials of their historical leaders. This trend reached its peak in 1981 (the 1300 year anniversary of Bulgarian state), when Delchev and Sandanski were openly made historical symbols of the Bulgarian state in a proclamation of Lyudmila Zhivkova. There were also attempts to rehabilitate Todor Aleksandrov because of his Bulgarian nationalism, but these remained controversial due to his role in suppressing the left wing, a role for which he had been declared a fascist. With both Bulgaria and Yugoslavia under Communist rule, there was no scope for IMRO's revival. After the fall of Communism in 1989 Yugoslavia began promptly to disintegrate and democratic politics in Macedonia revived. Many exiles returned to Macedonia from abroad, and a new generation of young Macedonian intellectuals rediscovered the history of Macedonian nationalism. In these circumstances, it was not surprising that the IMRO name was revived. A new IMRO was founded on 17 June 1990 in Skopje. Although IMRO claims a line descent from the old IMRO, there is no real connection between the old IMRO and the new one. The party is called the Internal Macedonian Revolutionary Organization-Democratic Party for Macedonian National Unity (In Macedonian: Vnatrešno-Makedonska Revolucionerna Organizacija-Demokratska Partija za Makedonsko Nacionalno Edinstvo, or VMRO-DPMNE) describes itself as a Christian Democratic party which supports the admission of Macedonia to NATO and the European Union. A minor political party carrying the name IMRO is the Internal Macedonian Revolutionary Organization–People's Party (VMRO-NP). Although a separate structure since the split in 2004, the political line of VMRO-NP is reminiscent of VMRO-DPMNE's and its members maintain close ties with the latter's party structure. A distinct IMRO organization was also revived in Bulgaria after 1989 first under the name VMRO-SMD (ВМРО-СМД – Съюз на македонските дружества) and then simply VMRO (ВМРО) as a cultural organisation. In 1996 the leaders of the organisation registered it as a political party in Bulgaria under the name IMRO - Bulgarian National Movement (ВМРО – Българско национално движение) and then simply ВМРО–БНД (IMRO-BNM). This group continues to maintain that Slav Macedonians are in fact Bulgarians. A small spin-off of the IMRO-BNM was until 2012 IMRO – National Ideal for Unity (ВМРО – Национален идеал за единство) and then simply ВМРО–НИЕ (IMRO-NIU), and uses the flag of IMRO. In 2014, the NIU of the NFSB joined. ^ a b Mark Biondich (2011). The Balkans: Revolution, War, and Political Violence Since 1878. Oxford University Press. pp. 67–69. ISBN 978-0-19-929905-8. ^ Duncan M. Perry, The Politics of Terror: The Macedonian Liberation Movements, 1893-1903, Duke University Press, 1988, ISBN 0822308134, pp. 39-40. ^ Frusetta, James Walter (2006). Bulgaria's Macedonia: Nation-building and state-building, centralization and autonomy in Pirin Macedonia, 1903–1952. University of Maryland, College Park, ProQuest. pp. 137–140. ISBN 0-542-96184-9. Retrieved 14 November 2011. ^ Bechev, Dimitar (2009). Historical dictionary of the Republic of Macedonia. Scarecrow Press. p. 100. ISBN 0-8108-5565-8. Retrieved 14 November 2011. ^ "Terrorist Transformations: IMRO and the Politics of Violence. Keith Brown. Brown University, The Watson Institute for International Studies". Watsoninstitute.org. Archived from the original on 4 September 2007. Retrieved 14 November 2011. ^ a b Mark Biondich (2011). The Balkans: Revolution, War, and Political Violence Since 1878. Oxford University Press. pp. 112–114. ISBN 978-0-19-929905-8. ^ Mark Biondich (2011). The Balkans: Revolution, War, and Political Violence Since 1878. Oxford University Press. p. 117. ISBN 978-0-19-929905-8. ^ Robert Bideleux; Ian Jeffries (2007). The Balkans: a post-communist history. Taylor & Francis. p. 190. ISBN 978-0-415-22962-3. ^ Frederick B. Chary (2011). The History of Bulgaria. ABC-CLIO. p. 71. ISBN 978-0-313-38446-2. ^ Mark Biondich (2011). The Balkans: Revolution, War, and Political Violence Since 1878. Oxford University Press. p. 151. ISBN 978-0-19-929905-8. ^ James Frusetta (2004). "Common Heroes, Divided Claims: IMRO Between Macedonia and Bulgaria". In John R. Lampe, Mark Mazower (ed.). Ideologies and national identities: the case of twentieth-century Southeastern Europe. Central European University Press. pp. 110–130. ISBN 978-963-9241-82-4. ^ Shaw, Stanford J. (27 May 1977). History of the Ottoman Empire and Modern Turkey: Volume 2, Reform, Revolution, and Republic: The Rise of Modern Turkey 1808–1975. Cambridge University Press. p. 209. ISBN 978-0-521-29166-8. Retrieved 14 November 2011. ^ "Encyclopædia Britannica – online, Internal Macedonian Revolutionary Organization". Britannica.com. Retrieved 14 November 2011. ^ Macedonia and the Macedonians: A History. Google Books. 2 August 1903. ISBN 9780817948818. Retrieved 14 November 2011. ^ Macedonia and Greece: The Struggle to Define a New Balkan Nation. McFarland. 1997. ISBN 9780786402281. Retrieved 14 November 2011. ^ "Freedom or Death. The Life of Gotsé Delchev by Mercia MacDermott, The Journeyman Press, London & West Nyack, 1978, p. 322". Kroraina.com. Retrieved 14 November 2011. ^ Идеята за автономия като тактика в програмите на национално-освободителното движение в Македония и Одринско (1893–1941), Димитър Гоцев, 1983, Изд. на Българска Академия на Науките, София, 1983, c. 34.; in English: The idea for autonomy as a tactic in the programs of the National Liberation movements in Macedonia and Adrianople regions 1893–1941", Sofia, Bulgarian Academy of Sciences, Dimitar Gotsev, 1983, p 34. Among others, there are used the memoirs of the IMRO revolutionary Kosta Tsipushev, where he cited Delchev, that the autonomy then was only tactics, aiming future unification with Bulgaria. (55. ЦПА, ф. 226); срв. К. Ципушев. 19 години в сръбските затвори, СУ Св. Климент Охридски, 2004, ISBN 954-91083-5-X стр. 31–32. in English: Kosta Tsipushev, 19 years in Serbian prisons, Sofia University publishing house, 2004, ISBN 954-91083-5-X, p. 31-32. ^ Таjните на Македонија. Се издава за прв пат, Скопје 1999. in Macedonian – Ете како ја објаснува целта на борбата Гоце Делчев во 1901 година: "...Треба да се бориме за автономноста на Македанија и Одринско, за да ги зачуваме во нивната целост, како еден етап за идното им присоединување кон општата Болгарска Татковина". In English – How Gotse Delchev explained the aim of the struggle against the Ottomans in 1901: "...We have to fight for the autonomy of Macedonia and Adrianople regions as a stage for their future unification with our common fatherland, Bulgaria." ^ The Times, (London), 16 September 1924, p. 9. An interview with Todor Alexandrov. ^ "The last interview with the leader of IMRO, Ivan Michailov in 1989 – newspaper 'Democratsia', Sofia, 8 January 2001, pp. 10–11". Macedoniainfo.com. Archived from the original on 6 October 2011. Retrieved 14 November 2011. ^ Statute of the Internal Thracian Revolutionary Organisation, 1923, Chapter I. – Goal – Art. 1. The Internal Thracian Revolutionary Organisation has the goal of uniting all the disgruntled elements in Thrace to the river Struma, regardless of their nationality, to win, through a revolution, a full political independence. ^ The Macedoine, "The National Question in Yugoslavia. Origins, History, Politics", by Ivo Banac, Cornell University Press, 1984. ^ Danforth, Loring M. (17 March 1997). The Macedonian Conflict: Ethnic Nationalism in a Transnational World. Princeton University Press. p. 64. ISBN 0-691-04356-6. Retrieved 14 November 2011. ^ "Freedom or Death, The Life of Gotsé Delchev, by Mercia MacDermott, Journeyman Press, London & West Nyack, 1978, p. 230". Kroraina.com. Retrieved 14 November 2011. ^ Болгарское национальное движение в Македонии и Фракии в 1894–1908 гг., Идеология, программа, практика политической борьбы, Лабаури Дмитрий Олегович, Местоиздаване и издателство: София, Академическое изд. им. проф. Марина Дринова Година на издаване: 2008, стр.7, ISBN 978-954-322-317-6 . ^ Petar Pop Arsov: prilog kon proučavanjeto na makedonskoto nacionalnoosloboditelno dviženje, Edicija Istražuvanja, Vančo Ǵorǵiev, MM, 1997, p. 44. ^ "Борбите на македонския народ за освобождение". Библиотека Балканска Федерация, № 1, Виена, 1925, стр. 11. ^ Кога зборувам за македонскиот народ ги имам предвид на прво место македонските Славјани. Под името македонски народ по тоа време мекедонските дејатели го разбираа целото население на Македнија, т.е. зборот Македонци имаше поскоро географски карактер...Кога револуционерната организација беше основана и почна да работи, ја започнува својата работа најнапред среде оние Македонци кои се викаа Бугари... Мемоари на Димитар Влахов. Скопје, 1970, с.21. ^ Революционното братство е създадено в противовес на вътрешната организация от еволюционистите. Уставът му носи дата март 1897 г. и е подписан с псевдонимите на 12 членове – основатели. Братството създава свои организации на някои места в Македония и Одринско и влиза в остър конфликт с вътрешната организация, но през 1899—1900 г. се постига помирение и то се присъединява към нея – Христо Караманджуков, "Родопа през Илинденско-Преображенското въстание" (Изд. на Отечествения Фронт, София, 1986). ^ Skendi, Stavro (1967). The Albanian national awakening. Princeton: Princeton University Press. pp. 211–212. ISBN 9781400847761. ^ Войната се връща, Анри Пози (Второ издание, Планета-7, София, 1992) стр. 33. ^ Огнянов, Михаил. Македония – преживяна съдба, С. 2003 (2 издание), с. 143 – 144. ^ "Принос към историята на Македонската Младежка Тайна Революционна Организация", Коста Църнушанов, Македонски Научен Институт, София, 1996. ^ Knickerbocker, H.R. (1941). Is Tomorrow Hitler's? 200 Questions On the Battle of Mankind. Reynal & Hitchcock. pp. 77–78. ^ Loring M. Danforth. The Macedonian Conflict: Ethnic Nationalism in a Transnational World. Princeton, N.J.: Princeton University Press, 1995. ISBN 978-0-691-04357-9.p. 73. ^ Мичев. Д. Македонският въпрос и българо-югославските отношения – 9 септември 1944–1949, Издателство: СУ Св. Кл. Охридски, 1992, стр. 91. ^ Stefan Troebst, “Die bulgarisch-jugoslawische Kontroverse um Makedonien 1967-1982”. R. Oldenbourg, 1983, ISBN 3486515217, p. 15. ^ Stephen E. Palmer, Robert R. King, Yugoslav communism and the Macedonian question, Archon Books, 1971, ISBN 0208008217, pp. 6-7. ^ a b c James Frusetta (2004). "Common Heroes, Divided Claims: IMRO Between Macedonia and Bulgaria". In John R. Lampe, Mark Mazower (ed.). Ideologies and national identities: the case of twentieth-century Southeastern Europe. Central European University Press. pp. 110–115. ISBN 978-963-9241-82-4. ^ The statute of VMRO-BND, 2008 (in Bulgarian) Art. 3. Par 1. Знаме с правоъгълна форма, разделено на две равни части, като горната част е в червен цвят, а долната – в черен и със златен надпис в средата ВМРО-БНД. Rough translation: Banner with rectangle form and divided into two equal parts. The upper part is in red and the lower part is in black colour. ^ The statute of Macedonian Party VMRO-DPMNE, 2008 (In Macedonian) Article 5, Par. 3: Партиското знаме е со димензии со однос 2:1 по должина, поделено на црвено-црни полиња, чиј сооднос е еден спрема еден, а во горниот лев агол на црвена основа е поставен партискиот грб. Rough translation: The Party flag has a ratio of 1:2, divided along the length in red-black halves, in ratio one to each other as one to one, and in the upper left corner on the red field is set the Party coat of arms. ^ According to an article from the Macedonian journalist Spase Shuplinovski in the Macedonian mainstream daily newspaper Utrinski vesnik – issue 1166, 16 October 2006, the flag of the Macedonian party VMRO – DPMNE was adopted from Ivan Mihaylov's IMRO, which was established in 1920 and was banned in 1934. ^ "The first central committee of IMRO. Memoirs of d-r Hristo Tatarchev", Materials for the Macedonian liberation movement, book IX (series of the Macedonian scientific institute of IMRO, led by Bulgarian academician prof. Lyubomir Miletich), Sofia, 1928, p. 102, поредица "Материяли за историята на македонското освободително движение" на Македонския научен институт на ВМРО, воден от българския академик проф. Любомир Милетич, книга IX, София, 1928; contemporary Macedonian translation: Tatarchev[permanent dead link]). ^ Materials about the History of the Macedonian Liberation Movement, Book V, Memoirs of Damjan Gruev, Boris Sarafov and Ivan Garvanov, Sofia 1927, pp. 8 – 11; the original in Bulgarian. ^ Gjorche Petrov in his memoirs speaking about the Salonica congress of 1896 writes: "There was pointed out the need for a statute and official rules. Until then we had a very short list of rules in force, drafted by Dame (with the oath). That little list was unsystematic, lytographed. It was decided to come up with a full list of rules, a statute. When I came to Sofia, I compiled it there (with Delchev).". ^ Пейо Яворов, "Събрани съчинения", Том втори, "Гоце Делчев", Издателство "Български писател", София, 1977, стр. 27: "Тоя събор утвърждава един устав на революционната организация, почти копие на стария български, твърде оригинален с положението, че само еkзархисти българи се приемат за членове на комитетите." (in Bulgarian) In English: Peyo Yavorov, "Complete Works", Volume 2, biography "Gotse Delchev", Publishing house "Bulgarian writer", Sofia, 1977, p. 27: "This meeting sanctioned a statute of the revolutionary organisation, almost a copy of the old Bulgarian, rather original because of the condition that only Bulgarians Exarchists would be admitted to membership in the committees." ^ Duncan Perry The Politics of Terror: The Macedonian Liberation Movements, 1893–1903 , Durham, Duke University Press, 1988. pp. 40–41, 210 n. 10. ^ Public Record Office – Foreign Office 78/4951 Turkey (Bulgaria). From Elliot. 1898; УСТАВ НА ТМОРО. 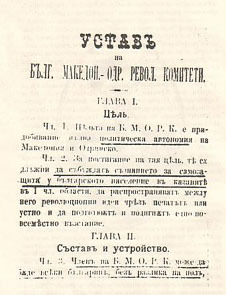 S. 1. published in Документи за борбата на македонскиот народ за самостојност и за национална држава, Скопје, Универзитет "Кирил и Методиј":Факултет за филозофско-историски науки, 1981, page 331 – 333. ^ H. N. Brailsford, Macedonia: Its races and their future, Methuen & Co., London, 1906. ^ A letter from the headquarters of the Second Macedonian-Adrianople revolutionary district, centered around Monastir (present-day Bitola), represented by Dame Gruev and Boris Sarafov, to Bulgarian government from 9. IX. 1903. Macedonian translation. ^ Carnegie Endowment for International Peace, Report of the International Commission to Inquire into the causes and Conduct of the Balkan Wars, Published by the Endowment Washington, D.C. 1914. ^ Palmer, S. and R. King Yugoslav Communism and the Macedonian Question, Archon Books (June 1971), pp. 65–67. ^ Palmer, S. and R. King Yugoslav Communism and the Macedonian Question, Archon Books (June 1971), pp. 112–113. Димитър Гоцев. НОВАТА НАЦИОНАЛНО-ОСВОБОДИТЕЛНА БОРБА ВЪВ ВАРДАРСКА МАКЕДОНИЯ. Македонски научен институт, София, 1998. Duncan Perry The Politics of Terror: The Macedonian Liberation Movements, 1893–1903 , Durham, Duke University Press, 1988. pp. 40–41, 210 n. 10. Георги Баждаров, "Моите спомени", издание на Институт "България – Македония", София, 2001. In English: Georgi Bazhdarov, My memoirs, published by Institute Bulgaria-Macedonia, Sofia, 2001. Albert Londres, Les Comitadjis (Le terrorisme dans les Balkans), Kultura, Skopje, ISBN 9989-32-067-5 (original edition: Arlea, Paris, 1992). Albert Sonnichsen, Confessions of a Macedonian Bandit: A Californian in the Balkan Wars, The Narrative Press, ISBN 1-58976-237-1. Also here Confessions, Ch. XXIV (in English), and Macedonian translation. Fikret Adanir, Die Makedonische Frage, Wiesbaden, 1979. Константин Пандев, "Национално-освободителното движение в Македония и Одринско", София, 1979. Ivo Banac, "The Macedoine", pp. 307–328 in of The National Question in Yugoslavia. Origins, History, Politics, Cornell University Press, 1984. Palmer, S. and R. King, Yugoslav Communism and the Macedonian Question, Archon Books, 1971. Keith Brown, The Past in Question: Modern Macedonia and the Uncertainties of Nation, Princeton University Press, 2003. Wikimedia Commons has media related to Internal Macedonian Revolutionary Organization.